As a huge musical fan, Les Misérables is one of my ultimate favourites. I’ve seen it three times and would go and see it again in a second. I love that it’s a more serious musical, giving something a bit different to the theatre. Les Misérables is the world’s longest running musical and is currently celebrating its 25th anniversary. Les Misérables opened at the Barbican Theatre in London on October 8 1985, moving to the Palace Theatre two months later where it remained until April 2004. Since then, the Queen’s Theatre has been the home of the show. Based on the novel by Victor Hugo, the musical was written by Alain Boublil and Claude-Michel Schönberg and directed by Trever Nunn and John Caird and has won eight Tony Awards. Starting in Paris in 1980, the show ran for three months but an English version was soon to be created. British producer Cameron Mackintosh heard the recordings of the musical and began producing the new musical, which would be in production for two years before it opened. Les Misérables follows one man’s emotional struggle from wrongful imprisonment to becoming a respected member of French society. The story revolves around Jean Valjean’s attempt at starting a new life, however one man, Inspector Javert, is determined to seek him out and send him back to prison. The story also sees the students’ revolt against authority, a love triangle and a blackmailing couple out to make the most out of any situation. The musical was originally panned by critics on its opening night at the Barbican; calling it “glum” and criticising its length (it is 3 hours long!) however audiences loved it and allowed the show to continue its run. 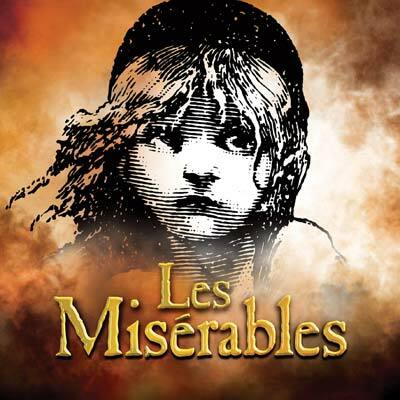 2010 marked the 25th anniversary of Les Misérables and saw the production play at the Queen’s Theatre in London’s West End as well as a touring cast take the show all over the country. The celebrate its anniversary, a huge concert was staged at the O2 arena in London which featured both old and new cast members, including Alfie Boe, Nick Jonas from the Jonas Brothers and Matt Lucas from Little Britain. 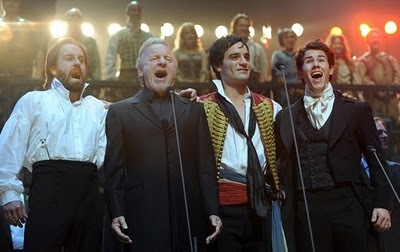 During the finale, the concert cast were joined by the London and touring casts as well as the original 1985 cast, including Colm Wilkinson and Michael Ball to perform “One Day More”. 42: The number of countries the show has been performed in. 56 million: The number of people who have seen the show. 40: The number of cast recordings. 308: The number of cities the show has been performed in. 45,000: The number of performances seen worldwide. 75: The number of major theatre awards the show has won. 10,000: The number of performances seen in London alone. The musical has seen a recent increase in popularity due to Susan Boyle’s first audition on Britain’s Got Talent. Her performance of the Les Misérables song “I Dreamed a Dream” became an instant internet hit and was seen all over the world, therefore giving Les Misérables more publicity and bringing in a new audience who may not have been aware of the show beforehand. At the 25th anniversary concert, the four actors who have played Jean Valjean in the relevant productions all joined together to sing “Bring Him Home”, one of the shows stand out numbers. The quartet also performed the number at the recent Royal Variety Performance and the song has been released with proceeds going to Tickets for Troops. Cameron Mackintosh has recently signed the contracts to make a movie version of the musical with Working Title. Les Misérables is a fantastic, unique musical which never fails to give me goosebumps and I strongly urge you to go and see it, you will not be disappointed. Filed under Home, Interest, Misc.